This charming two-bedroom apartment in Barcelona, located in the Eixample district is the perfect choice for your trip to the Catalan capital. 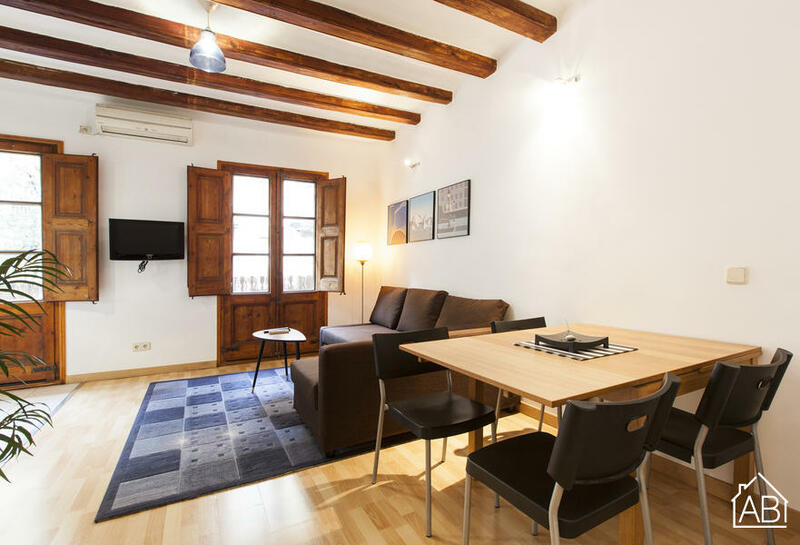 Situated in close proximity to Las Ramblas and Plaça de Catalunya, you will enjoy easy access to both the historical and modern side of the Catalan capital. This space is perfect for couples or families and can accommodate up to five people. This quaint space will transport you back in time with traditional touches, best seen in the exposed ceiling beams, the parquet flooring and the French windows, which allow for natural sunlight to fill the apartment throughout the day. This mix of comfort and style welcomes you upon arrival, with a traditional design that makes this the perfect home-away-from-home. The living room has comfortable sofas, and a TV, perfect for relaxing after a day of sightseeing. There is also an Internet connection in this apartment. The kitchen is well equipped with plenty of the utensils and appliances needed to create your very own home-cooked meal. The main bedroom has a double bed, while the second room is furnished with a single bed. The apartment has one bathroom with a walk-in shower. This amazing apartment, complete with air-conditioning and access to a balcony, is the ultimate choice for your trip to Barcelona, any time of the year.